Is that the old train from around the paddle boat lake? Very cool to see historical things being re purposed. Gives the theming so much more meaning! I've had a look at the photos on this thread and the park is looking very clean and professional! Seems that everything in the park without a theme has now been themed! The park looks radically different from what it looked like in ~2009, when Turbo Mountain and Bountys was still around. Obviously if it looks radically different it means it looks much better! Yup. Its is defiantly un recognisable from 2009. Cant wait for MI3. AW was closed down early today due to serve weather warnings today in Perth. Just a question, is it true that the go karts don't run on full power?? Don't forget everyone, the early-bird season pass offer closes Monday. They've also got a discounted ticket offer for these holidays, I presume it's because the weather is so delightful. Due to popular demand, the early bird season pass sale has been extended until October 16. Good news for those still on the wall about getting membership. I heard that their website was having issues as a lot of people were getting them today. I doubt they would extend there early bird sale (no offense mark) as it actually lower there profits. But in saying this, customer satisfaction and more publicity, and people telling people telling people could work in a way, d pending on what margin of profit they are making on the sale, actually, disregard my first sentence, it would probably boost guest numbers a lot during the season. And doing it till when the school term starts is a good idea, because people have their first payday after spending money on the holidays. Just was thinking about AW's FN's event and how they are introducing Summer nights. I was wonder if in the future we will see a christmas event or even an easter event to try and draw more crowds to come during the April months. Considering April is usually a quite period for the park. Considering FN's has been a massive successes for AW it wouldn't surprise me if more events come about in the future and we have seen summer nights being introduced this season. USS do a good Easter event and christmas event if anyone is interested. Just wanted to congratulate @Mark Shaw and his team for their nomination in the WA Tourism Awards. Not only is the park a finalist in the Major Tourism Category, but one of their team members has been nominated for The Sir David Brand - Young Achiever Medal. Best of luck for November 12! Congratulations @Mark Shaw and team. I saw that you are also finalist in the AIM/West Business Pinnacle Awards for the second year in a row for the category of Customer Service Excellence and you won it last year. I must say this award is very well deserved! The customer service at AW is great. The staff are always so friends, helpful and its makes the day so much more enjoyable. You should be very proud of yourselves and I am so glad I call AW my home park. I am looking forward to visiting soon. The next 3 days are suppose to be 30 degrees and then we go back to the cold rain. The irony being that Adventure World will be closed Tuesday and Wednesday. It always works that way. The good weather comes when they are shut and the bad weather comes when they are open. watch out for imminent announcement on Social media regarding our new " Cirque Extreme" show for the Summer school holidays. Big top thrills, free show, twice daily. Adventure World is thrilled to announce the arrival of a new attraction, Cirque Extreme! for this summer! “Cirque Extreme! 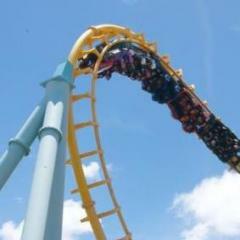 is nothing like you have seen at Adventure World before. Circus Joseph Ashton have been stretching the human limits of circus for over 150 years and have worked on some amazing projects, including with Baz Luhrmann and Nicole Kidman on the movie Moulin Rouge” said Mark Shaw CEO Adventure World . “We are really excited to bring an Extreme! version of these shows to Adventure World this summer”. Expect to be thrilled by acts like the wheel of death, flying trapeze, extreme contortion, flame throwing, illusion and more. And as with most things at Adventure World – be prepared to get a little wet! From AW's Facebook page. Seems like a great idea. I wonder if they'll use that nice new area of flat ground. AW did say in one comment on Facebook that the new lawn area will house future shows. So I am going to assume so. Plz tell me this isn't mi3 ?? This is a show that is coming for summer. MI3 is coming next year. This is the equivalent of Dinosaur Island or Prison Break Live - a filler for a gap year. What gets me about this is that we didn't see it coming - they were doing so much else that we thought they'd done enough already. I think it's a smart move. It'll hit the target market pretty well and be a crowd pleaser. With two shows a day it should soak up capacity and give people a place to shelter from the midday sun. I hope this is in addition to the kids' 3pm show, which is a different market segment. I had to laugh when I saw this post. Sorry. "mi" prefixes stand for "maximum impact" and only for permanent attractions. depending on how this is received, it is possible it will become a summer hoildays regular addition for a while. we were planning on using the new lawned area however the usage of this area does contradict the move to create more lan space to spread people out a bit more during busy periods and we would have killed the new lawn. We have created an area at the base of Kraken between Kraken and Race Track for the big top tent which also provides ease of access from the rear and space for trucks. Earth works for this started last week and will be completed this Tuesday/Wednesday. ^^ That does make sense and you wouldn't want to kill the lawn which you sent quite a bit of money on. The show should be a great capacity soaker taking the aprox 650 people.